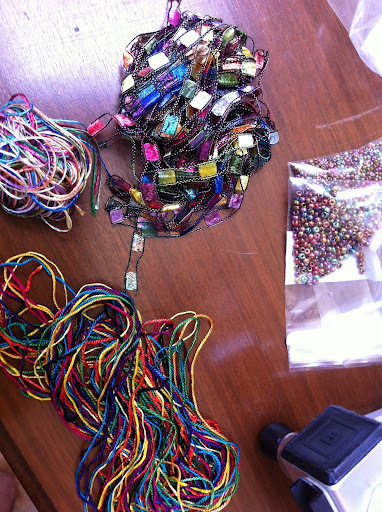 This week we will work on beginning weaving your cuff and adding beads to your weaving. There are many different tapestry techniques you can use when weaving a cuff, but if you are a beginner you may want to just begin with straight lines. One of the difficult things about weaving tapestry is that there is a tendency to “pull in”, which means you pull your edges in too tight making the edges (or “selvages”) of the piece not straight. This piece makes keeping your selvages straight easy, both because it is thin and because the rows of beads help space the piece. On a more personal note, my soon-to-be mother-in-law (on August 6th!) is visiting from Ukraine. 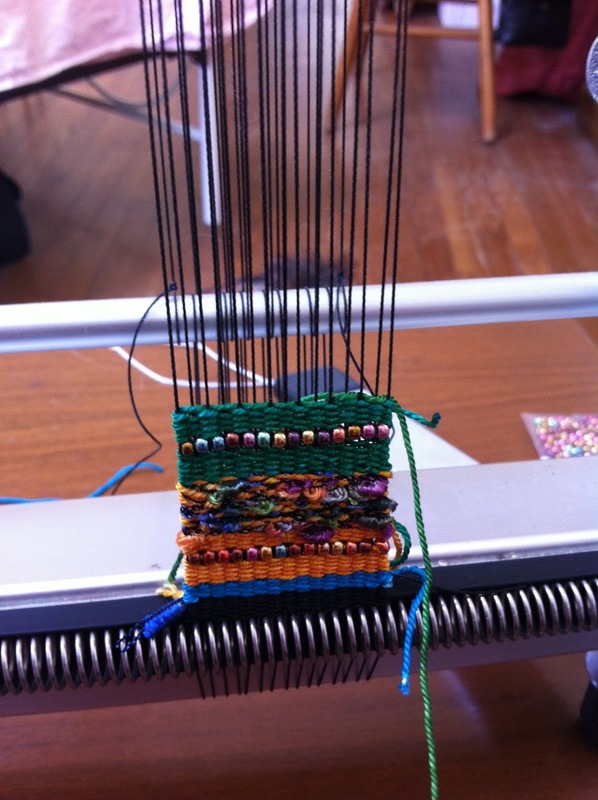 She wanted to learn to weave so I am having her (under my supervision… although this mostly means me hanging over her with my camera) make her own tapestry/bead cuff bracelet on my warped loom. The pictures following are of her work. This is the first time she’s touched a loom and she barely needs any instructions… which is good since we can only communicate in Greek (Alex, my fiance, and I met in Greece where he was living, his mom was living and I was living) and I’ve never taught anyone in another language before. Because these cuffs seem to look awesome no matter what, we often weave them with no solid plan. But, some of you may want to decide what you will weave before you begin. You may want to decide on some basic design elements before you begin. For example, do you want to put in beads in regular increments or randomly? Do you want to have stripes? What types of tapestry techniques so you want to use? If you have a tapestry/bead cuff bracelet kit purchased from us, you have a variety of hand-dyed silk and other yarns to choose from when making your cuff. Before you begin weaving, take a look at what colors you have available and try to decide what ones you want to use. If you do not have a kit purchased from us, decide on what types of yarn you want to use as well as what colors. The concept of tapestry weaving in this format is very simple. You engage the shedding device (just like you did when weaving your header) and weave through. We recommend starting your weft threads in the middle of the piece instead of on the edges so your ends are all facing the back (if you don’t, make sure to wrap the ends around so they do face the back). Weave through once, change the position of the shedding device and then weave through again. Continue doing this. You can mix colors (two silks together make a gorgeous pattern), mix different types of yarn (the silk and novelty railroad yarn look great together) or just stick with solid stripes. We will discuss different tapestry techniques you can use next week. 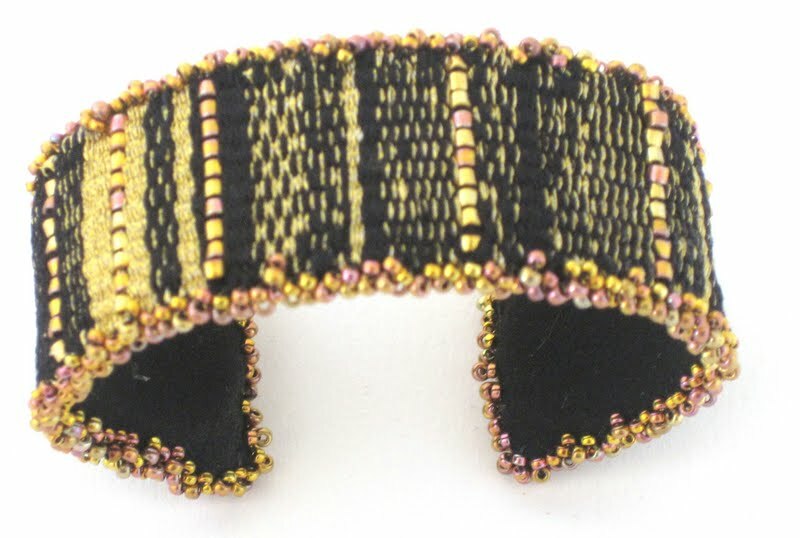 Using beads is what makes the tapestry/bead cuff bracelet unique. 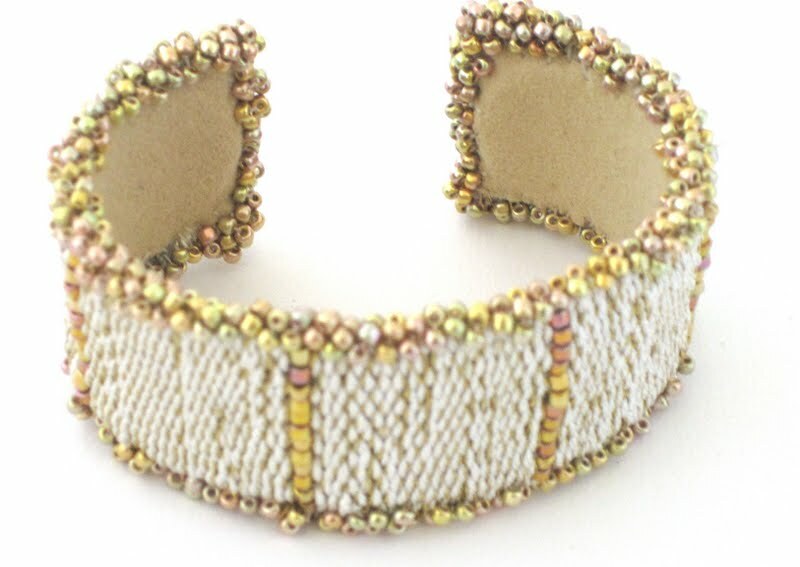 The beads are actually woven into the cuff on whatever you are using for weft. 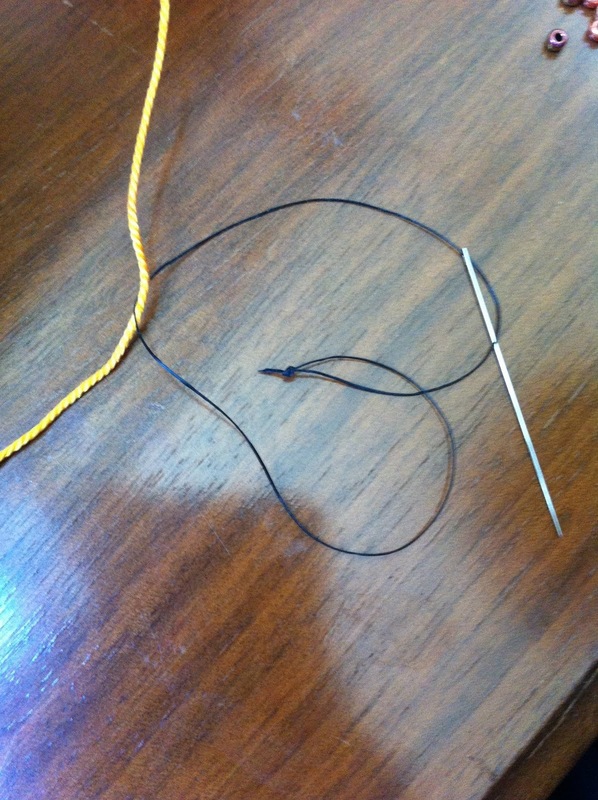 The first step to doing this is to take a piece of beading thread (as you know, we use C-Lon thread) and tie a loop of it onto a needle. You will then put your weft thread (let’s say you having been weaving with yellow silk, you will put that piece of silk through the loop you made with the beading thread and then put 14 size 8.0 beads on the needle, moving them over the loop and onto the silk (or whatever your weft thread is, make sure it is thin enough to put the beads on it). Thread tied in a loop threaded through a needle. 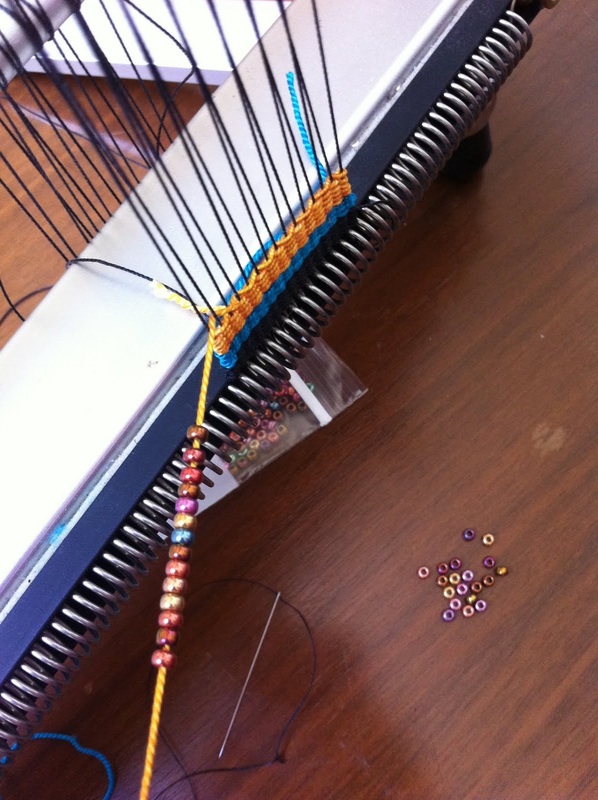 Next, (making sure you remembered to change sheds) place the beads on the silk between the spaces in the warp threads. They should fit exactly (this is why it is important to have the ten dent spring… spacing matters a lot when you are using beads in tapestry). 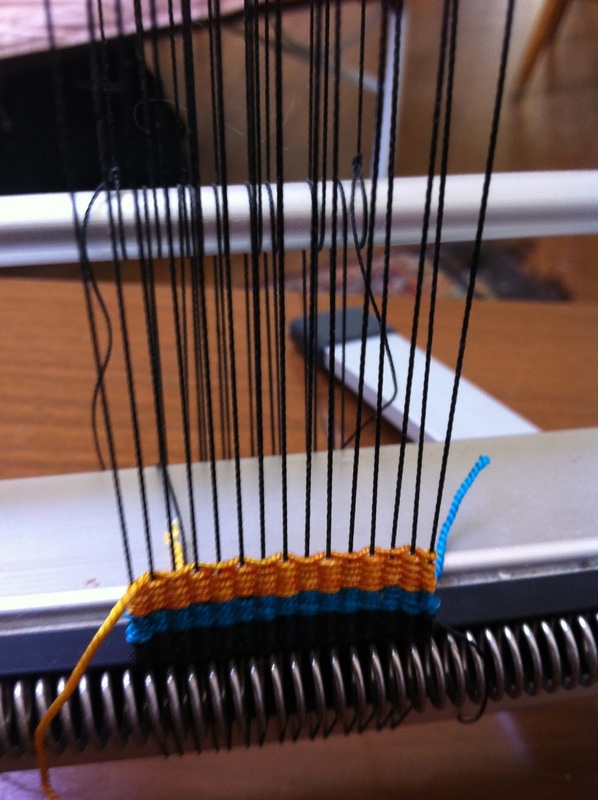 Then, continue weaving with the same thread. Keep experimenting mixing fibers and adding beads. Next week we will discuss different tapestry techniques you can use in your cuff! Welcome to The Mirrix Tapestry and Bead Looms Weave-Along! Welcome to the first official day of the Mirrix Tapestry and Bead Looms Weave-Along. If you are a participant, we look forward to getting to know you and your work! If you are just observing, enjoy! We hope everyone will learn a lot from this experience. Catch-up for those who are behind. This week we will set up our looms, warp and weave a header. For those of us who have warped before, this won’t take very long at all. For beginners, take your time and read all the directions and you will be fine. 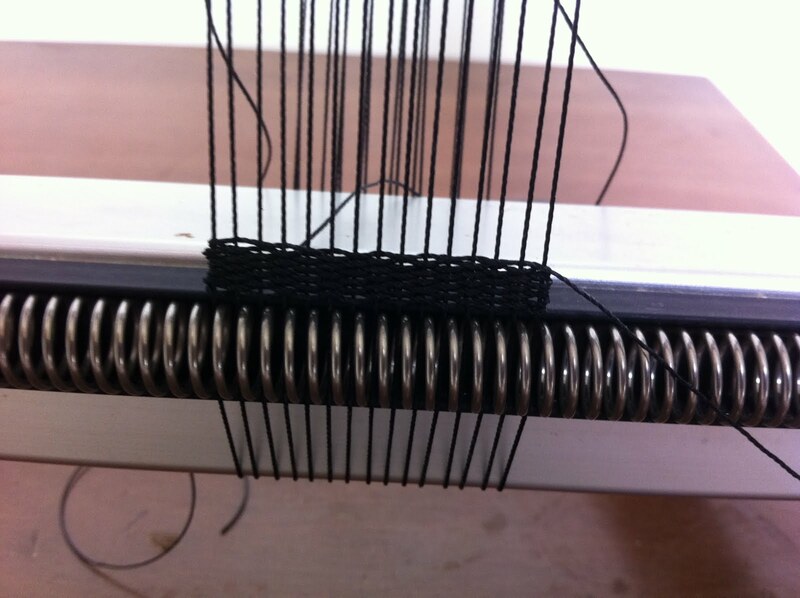 Warping: For the tapestry/bead cuff you will warp your loom for tapestry rather than bead weaving (this means one warp in each dent instead of two). You can also refer to the instructions that came with your tapestry/bead cuff bracelet kit if you have one. You will need to warp fifteen dents across for this project. 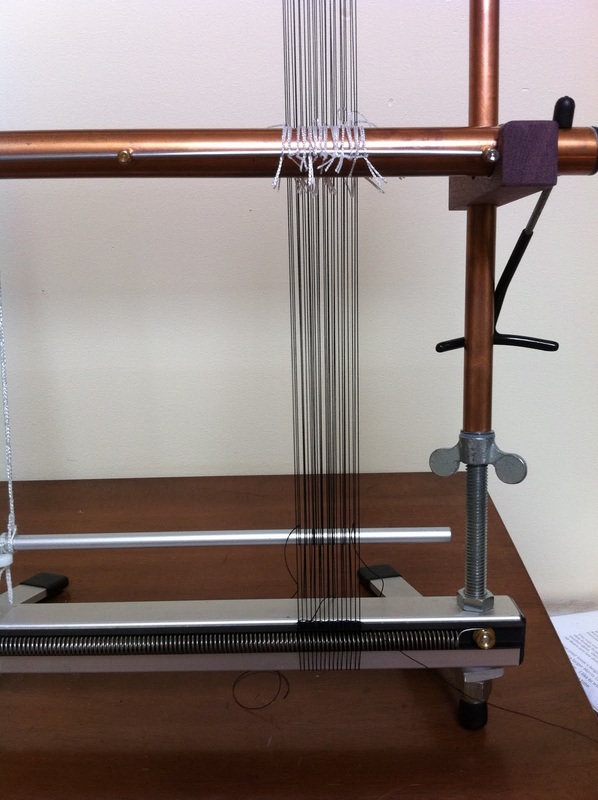 Following are pictures and brief explanations of how to warp for this project (if you have never warped before you will still want to refer to the warping instructions) using my loom as an example. First, place the warping bar between the two clips (turn the clips backwards and push them in slightly to hold the warping bar while warping. 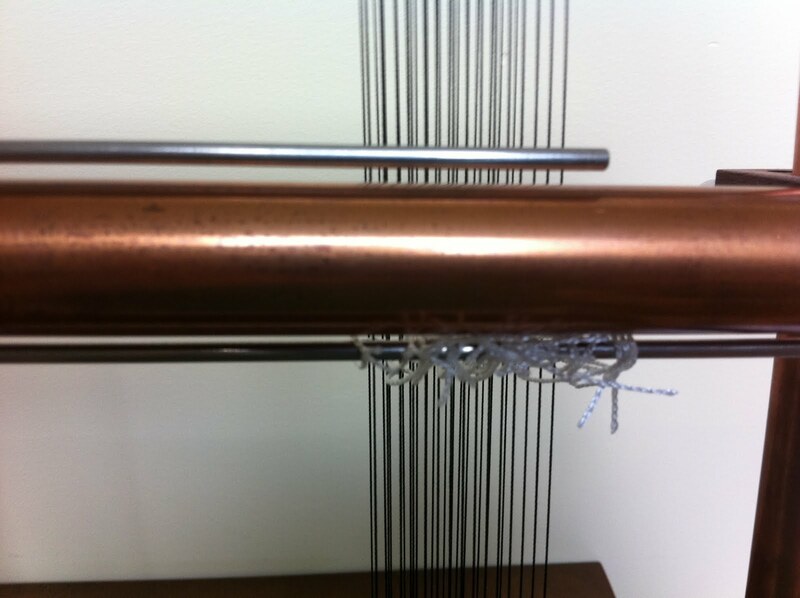 (Note: I have a bottom spring kit on this loom, although one is not necessary for this project. A bottom spring kit is used to organize your warps and is especially useful when weaving wide bead pieces or small-scale tapestry pieces. They can be purchased on our website: http://www.mirrixlooms.com/accessories.html). 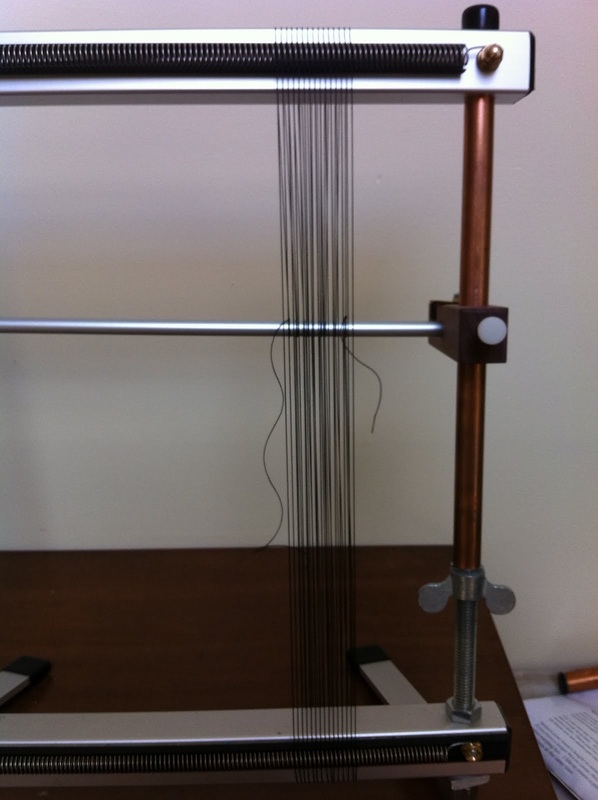 Loom with warping bar between the two clips. 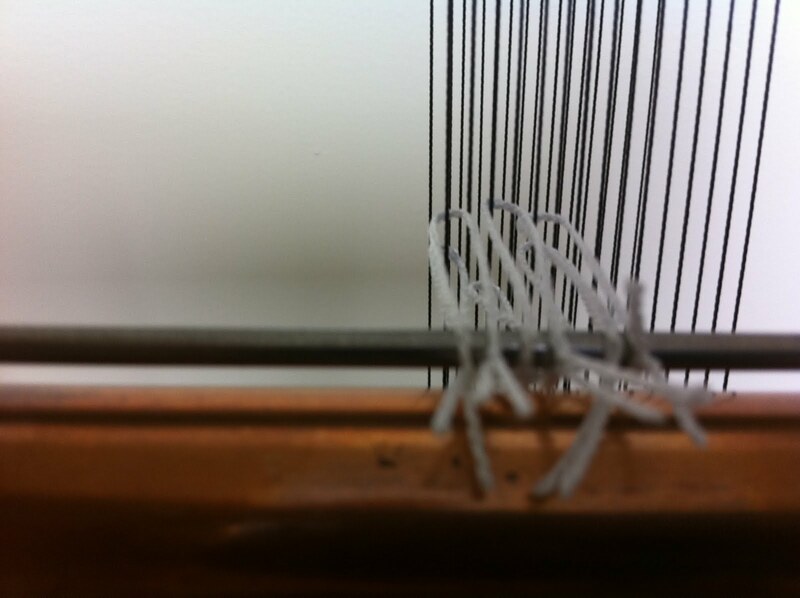 My loom, just as I finished putting the warp on. The top of the loom, fifteen warps across. Because this is a relatively thin project, I warped my piece on one side of the loom. When I was done warping, I tied a piece of cord (any string can be used) on the other side of the loom to the warping bar to keep it balanced. Alternatively, you can warp another piece on the other side to weave later. Loom with warp on it. 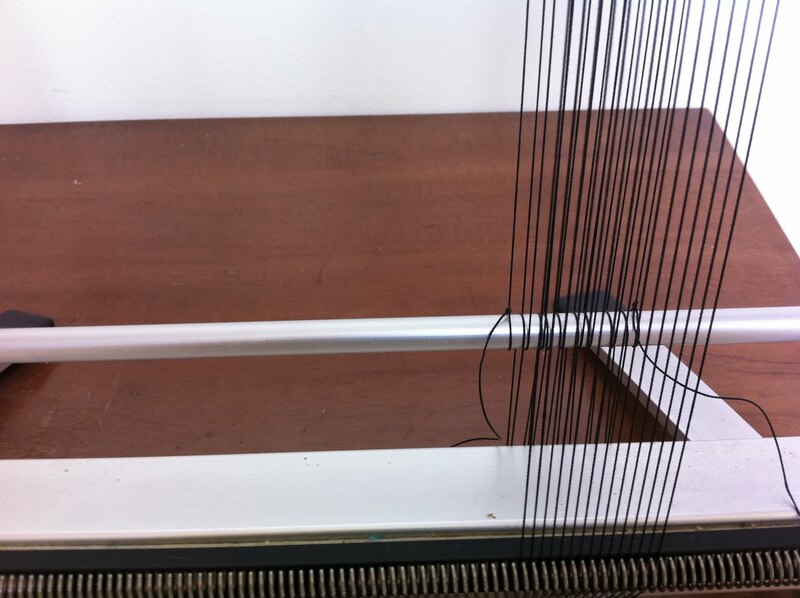 The cord on the right side helps balance the warping bar (which has been pulled down lower on the loom). Looking down at the warping bar towards the bottom of the loom. Next, I placed my shedding device in the clips (turning them around so they stick forward) and began putting heddles on. Beginning to put heddles on. They attach the warp threads to the shedding device, allowing you to change sheds when you change the position of the shedding device handle. After putting heddles on every other warp, I rotated the warping bar and began to put heddles on the warps that did not already have heddles on them. The shedding device, rotated and ready for more heddles on the other side. The loom, warped and with heddles on both sides of the shedding device. I’m almost done! Close-up of the heddles on the loom. 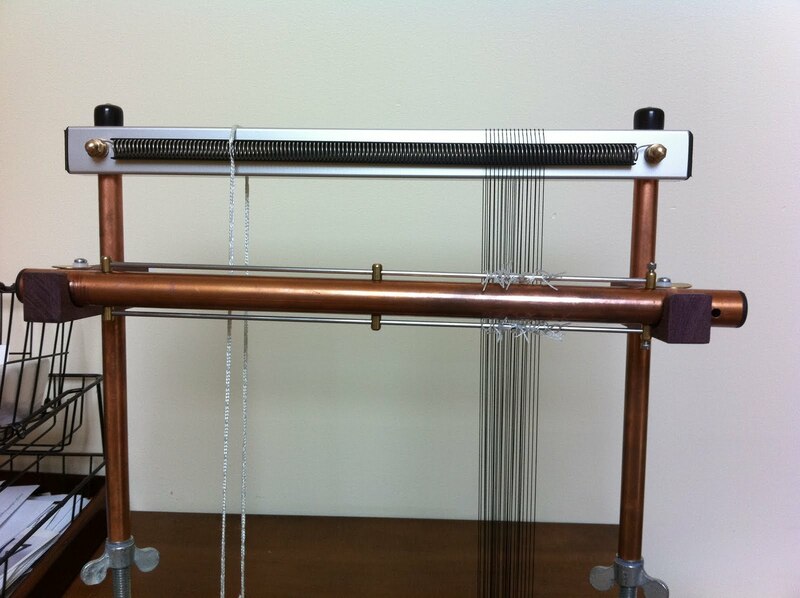 The loom, ready to be woven on with the shedding device handle attached. A header is woven before you start your piece to provide a strong base that will eventually be folded over during the finishing process. I used the C-Lon cord that I warped the loom with to weave this header. It should be about 1/2 inch of weaving. C-Lon cord to be used for my header. Once the shedding device was put on the loom, all I had to do was engage the shedding device (the shedding device raises half the warps) and place my weft between those warps. (When you are doing this, make sure your weft ends face the back of the piece, this can be accomplished either by wrapping your end around so it faces back or by starting your weft in the middle of the piece.) Then, I changed the shed by moving the shedding device into the other position (and therefore raising the other half of the warps) and wove through again. All set to weave the cuff!!! That’s it, warped and ready! 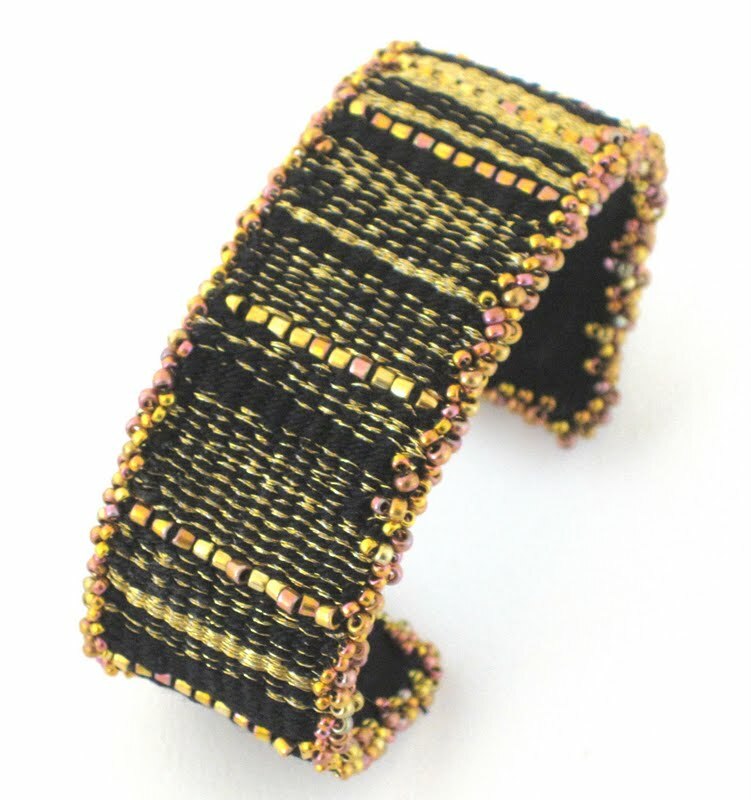 Next week we will begin weaving the actual cuff and learning how to add beads! on the Mirrix Facebook Page or the Mirrix Ravelry Page. 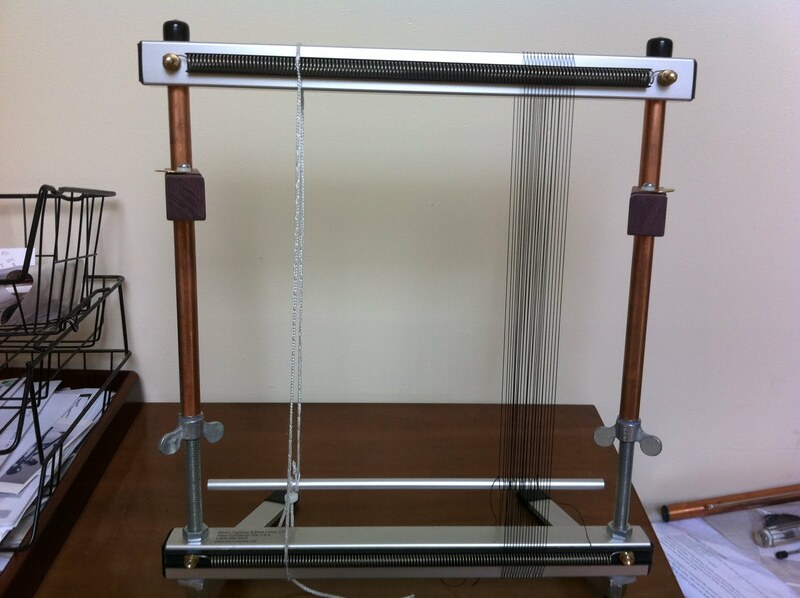 Welcome to our first ever Mirrix Looms weave-along. The weave-along will officially begin tomorrow, but today we wanted to go over the basics of how the weave-along will work and make sure you have everything set up for tomorrow. On Sunday, July 24th we will begin warping! We will send out an email (At about noon EDT and 9 in the morning PDT) going over what we want to accomplish for the week including tips and tricks. At that time, we will welcome comments on the blog (where we will repeat this information), on Facebook, on Ravelry and by email. As a member of the weave-along, we hope you will post on one of these forums at least once a week on Sunday to tell us your progress and ask questions or give some advice. We also encourage all participants to continue posting throughout the week. All forums will be closely monitored. Every Sunday after the weave-along begins we will send out another email discussing progress from the week before and plans for the week ahead and discuss progress online. The weave-along will be over mid to late August. If participants fall behind, we will keep forums open after that period for weave-along related discussion. 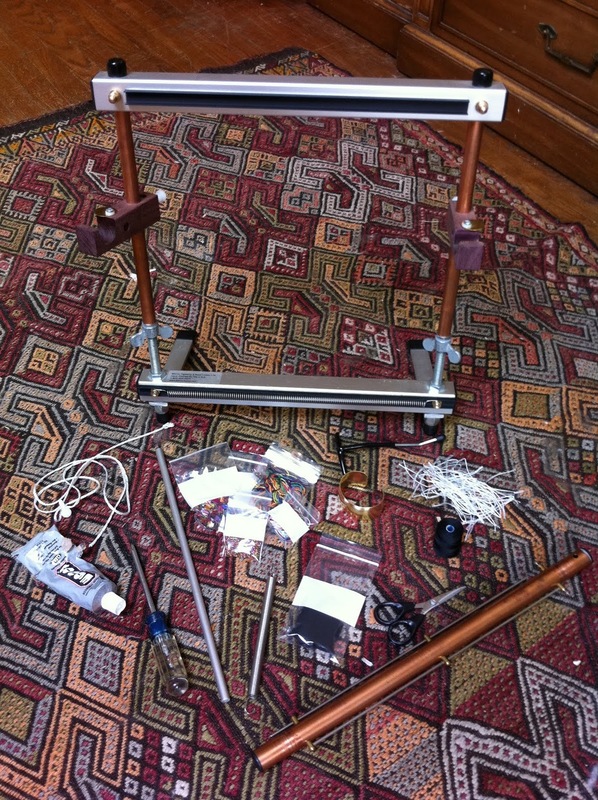 -A Mirrix Loom (preferably size 12 or larger with a shedding device) and all that comes with one. 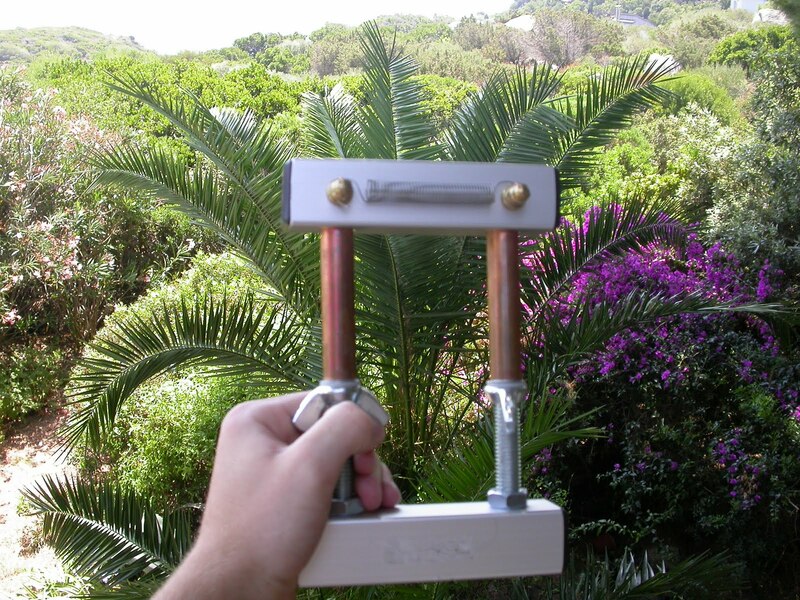 -A ten-dent spring (if you do NOT have one we can work with a twelve-dent spring by stretching it but we do recommend having one). 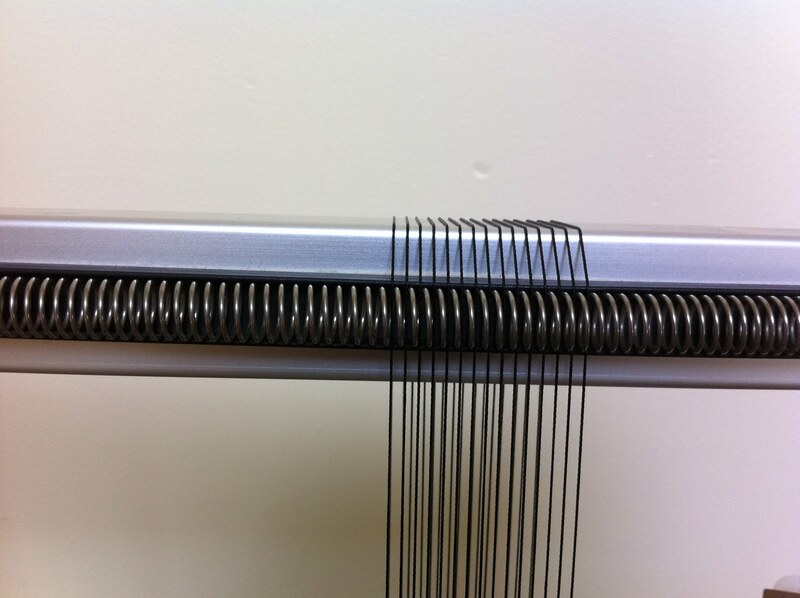 Remember having a ten-dent spring means that there are ten dents (spaces in the warp coil) in an inch when on the loom. -Heddles (To make them yourself: You will need to make as many individual heddles as there will be warps in your weaving. These heddles (as well as the Mirrix heddles you can buy) will be reusable. The thinner and stronger the string you use, the better. For bead weavers, cotton quilting or beading thread works great. For tapestry weavers, cotton crochet thread, linen warp or single-ply cotton warp works well. -Glue that can bond fabric to metal. These types of glue are available through craft outlets. You will only need this for finishing your cuff. 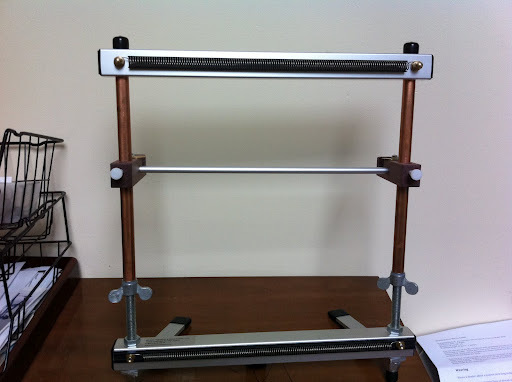 How you want to set up your work space is up to you, but we suggest finding a flat surface and organizing everything you will need to warp the loom and begin weaving. 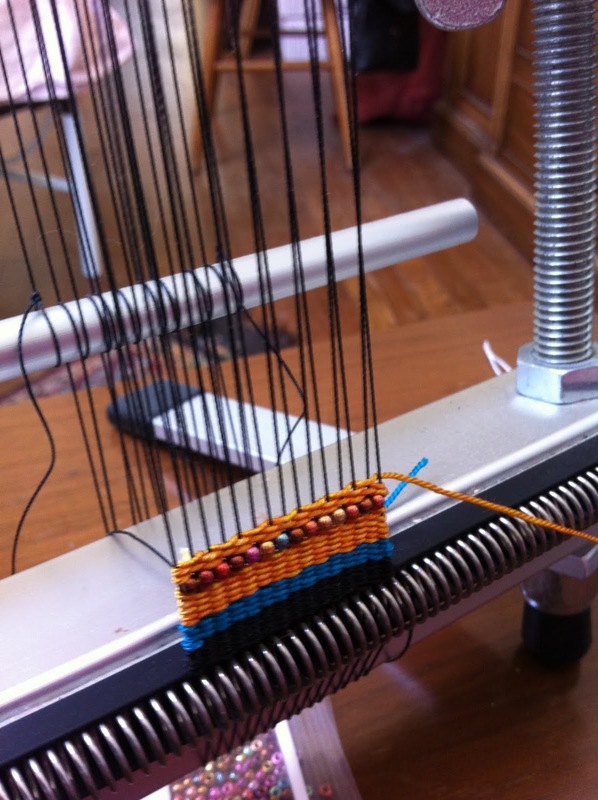 Swing out the two (or one if you are using an 8″ loom) legs under the loom and place it on a flat surface. 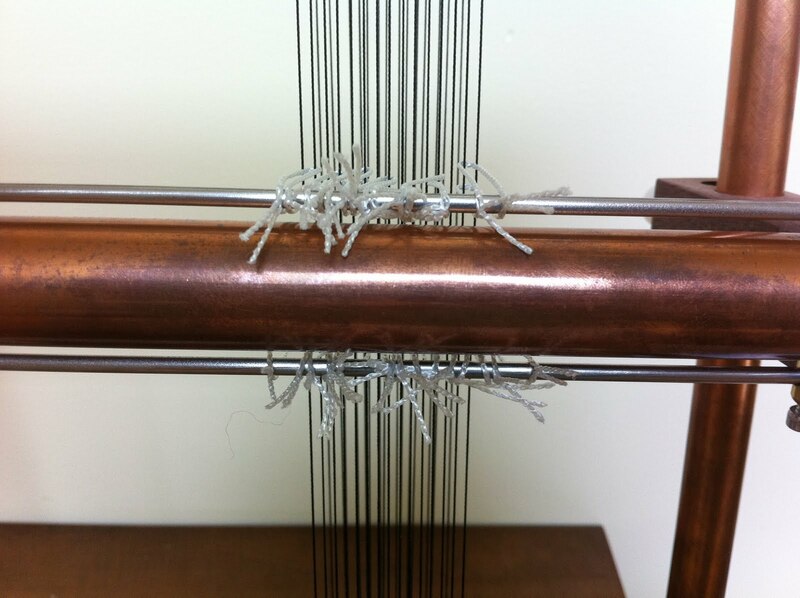 Make sure your loom is at a height so you have about 2″ of threaded rod showing on each side. Measure to make sure the loom is even. 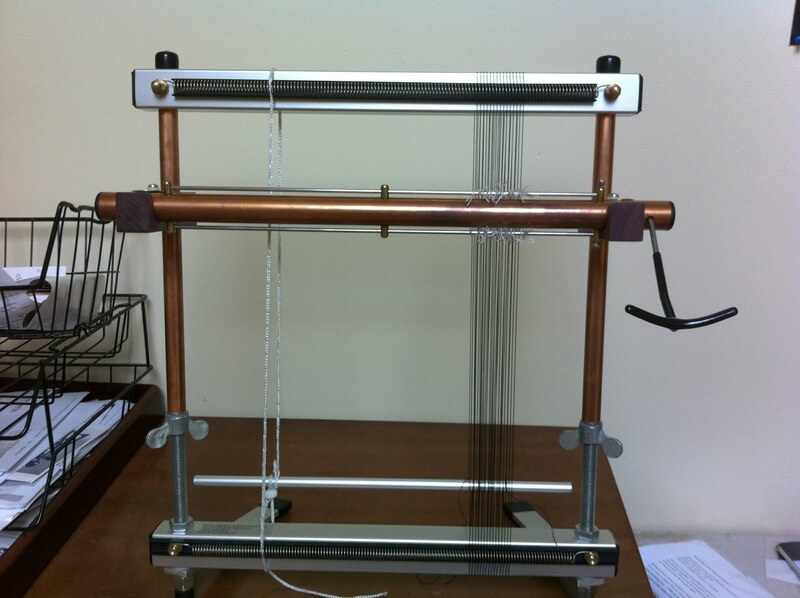 We suggest if you are using a size 12″ loom or larger that you put your weaving on the left or right side of the loom. 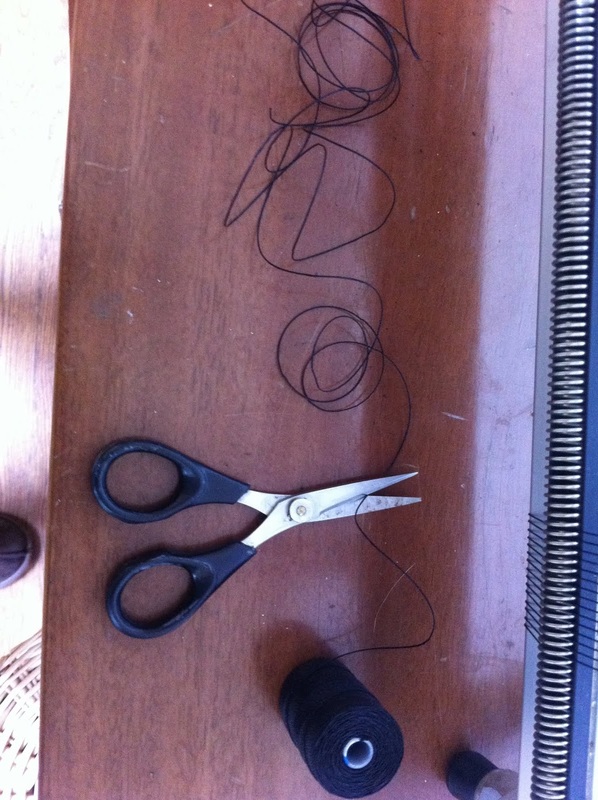 You will need some kind of string to tie around the warping bar on the opposite side of where you will put your piece. You will do this after you have warped your loom. It will help to stabilize the warping bar. The reason you don’t put it in the middle of the loom is, because it is such a thin piece, it is difficult to balance the bar. You may want to warp the loom on both sides and make another piece on the other side at a later date. For example you could warp the other side 10 warps wide and make a little purse. 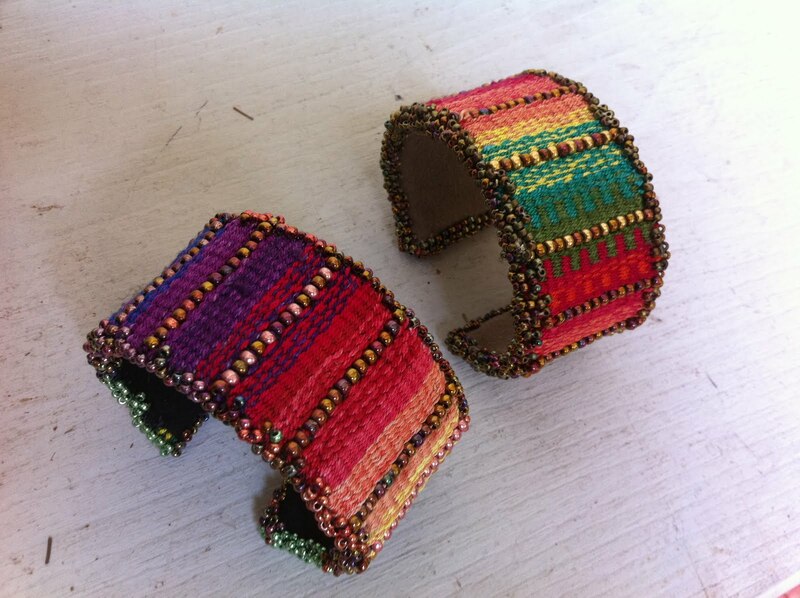 The tapestry/bead cuff bracelet cuffs come with enough extra yarn to make another piece. 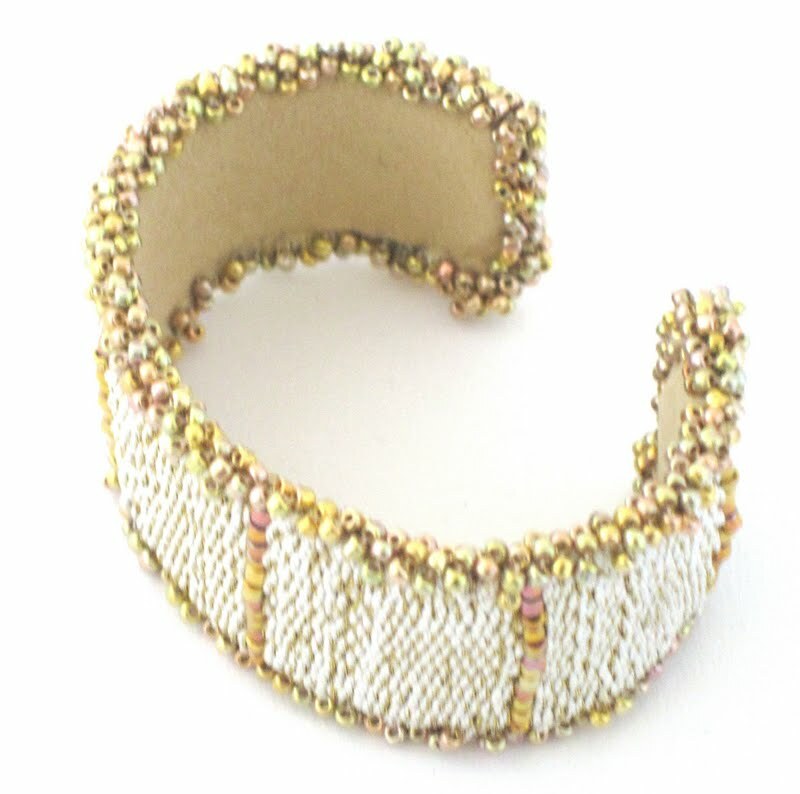 Everyone taking part in the weave-along will be entered to win a wedding cuff bracelet kit at the end of the weave-along. You must participate regularly to be qualified to win. If you have a question at any point during the weave along, you can either ask everyone by posting as a comment on the “A Word From Elena” blog, as a post on our Mirrix Facebook Page, or in our weave-along thread on the Mirrix Ravelry Page. You can also email us directly. More tomorrow! We suggest checking out the warping instructions on our site today if you haven’t done so before. 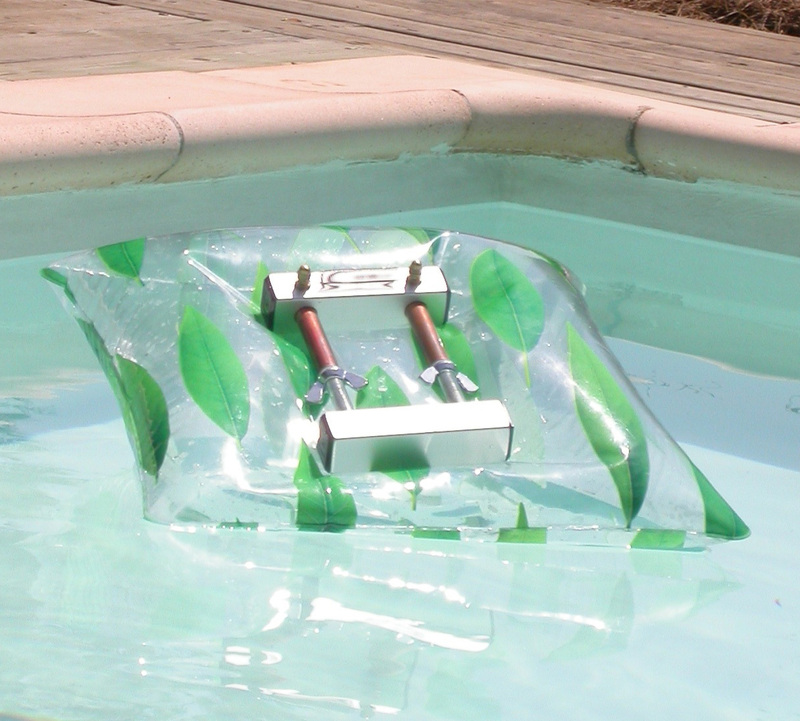 While Claudia and Elena are working feverishly to get everything ready for the weave-along, the Mini Mirrix is on vacation. She’s headed to the beach. That’s the great thing about the Mini Mirrix (which is just her nickname, she’s really the Loreli Loom), she can go ANYWHERE. 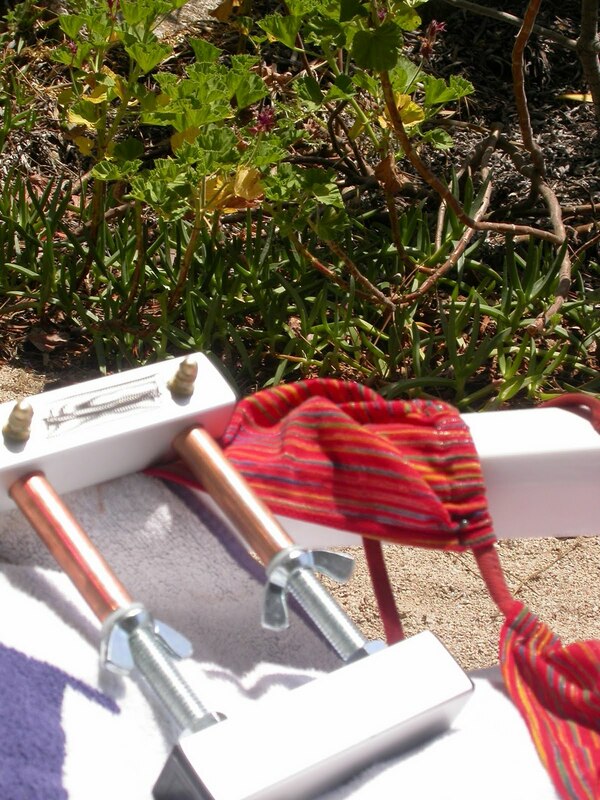 In fact, when she flys, she doesn’t have to be in a checked bag (**disclaimer, please check with your airline before flying with any of your looms) and when she goes to the beach, she can easily ride in any little tote. She even goes hiking sometimes… she loves to bead at the top of a mountain and enjoys making a quick bracelet after a nice walk by the lake. That’s the white water. I couldn’t believe the blue of it, which in real life looked exactly like that with the exception of an extra dash of purple. 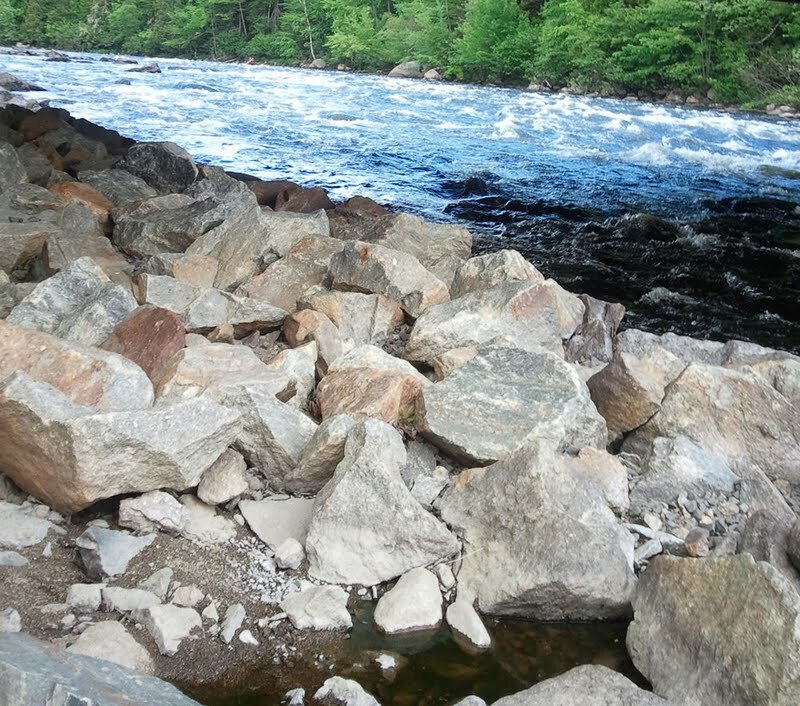 The weaves at times were several feet high and there were rocks everywhere, but we prevailed although I used up my monthly allotment of adrenalin. Yes, we wear wetsuits and helmets and footie things so if we go over we won’t freeze to death or have our skin peeled off by the rocks. The goal is to never go over. 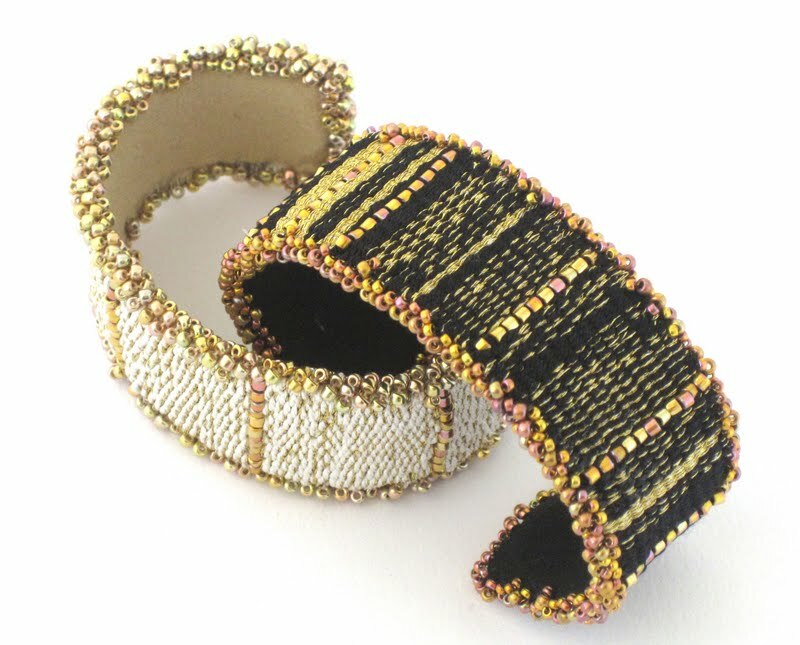 If finally finished the two cuff bracelets woven from silk, gold spun on silk and 24 karat gold plated beads. A kit is in the making. For the black one I used a variety of techniques including pick and pick, wavy lines and blending by weaving with a thread of silk and gold. This one is very simple. I spaced the rows of woven beads by one inch. I simply combined a thread of silk and gold and just wove back and forth. This could very much be a beginner project because it is so simple. This is how the weave-along will work. *On Saturday, July 23rd I will send out a preliminary email going over the weave-along tentative schedule. *On Sunday, July 24th we will begin weaving! We will send out an email (At about noon EDT and 9 in the morning PDT) going over what we want to accomplish for the week including tips and tricks. At that time, we will welcome comments on the blog (where we will repeat this information), on Facebook, on Ravelry and by email. As a member of the weave-along, we hope you will post on one of these forums at least once a week on Sunday to tell us your progress and ask questions or give some advice. We also encourage all participants to continue posting throughout the week. All forums will be closely monitored. *Every Sunday after the weave-along begins we will send out another email discussing progress from the week before and plans for the week ahead and discuss progress online. We look forward to beginning and have been very happy with the great response to this project! If you have not already signed up, please email elena@mirrixlooms.com to express your official interest and receive updates!